I have said it before and I say it again. 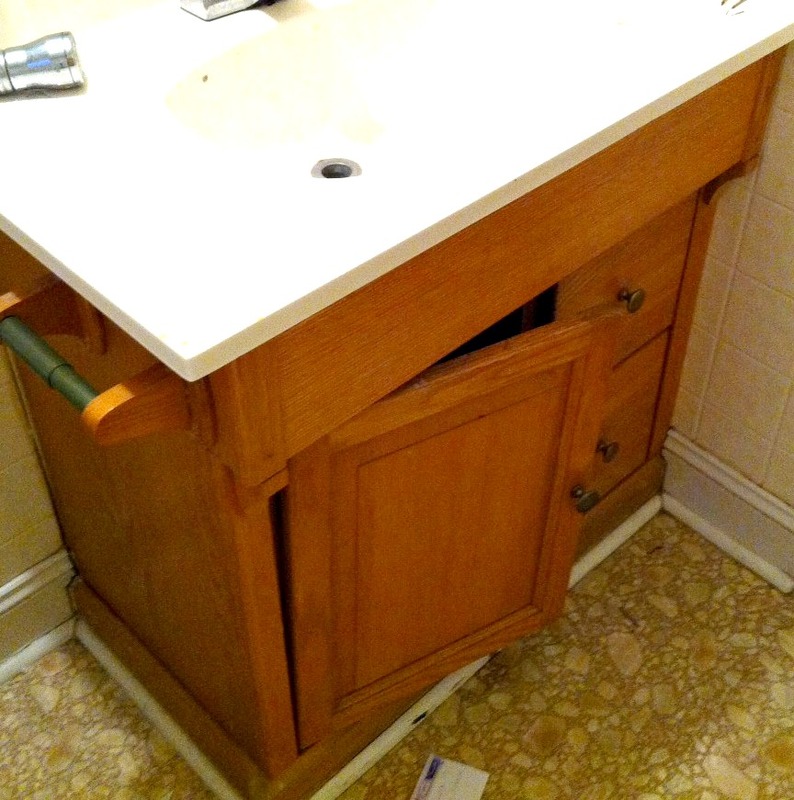 It isn’t always necessary to gut an older bathroom or kitchen. 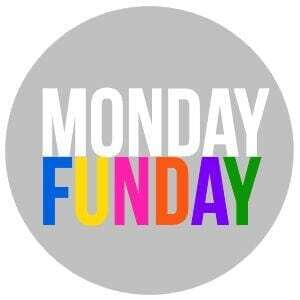 Sometimes a can of paint or stain can take care of an eyesore and save hundreds or even thousands of dollars. 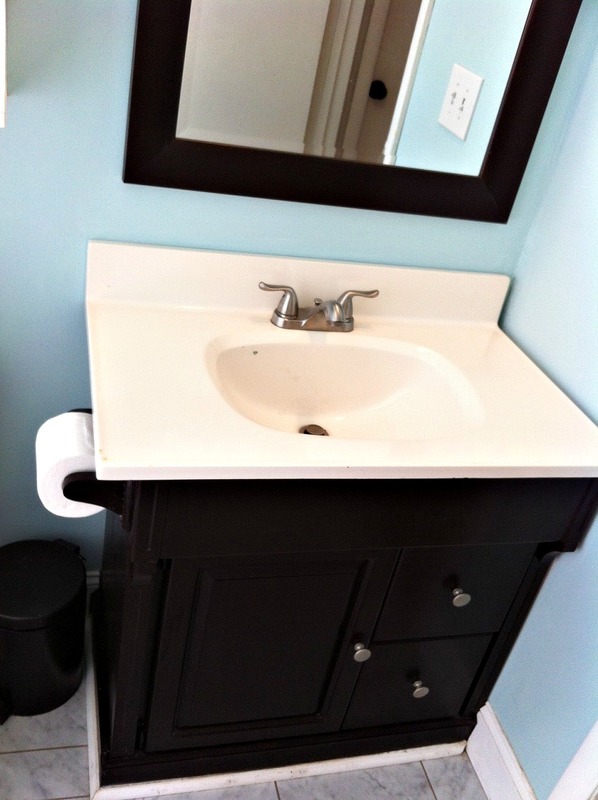 This was the case with by bathroom vanity. It was old and it needed some TLC for sure. See the hanging door? This was the vanity and sink in our bathroom (it’s the only bathroom in our house). 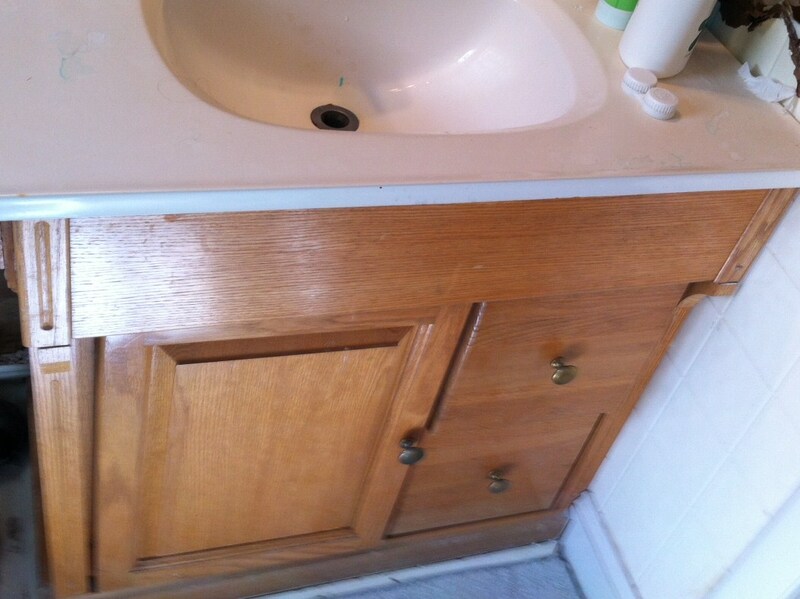 To replace the vanity and sink would have set me back at least $300 and I know it wouldn’t be solid wood. 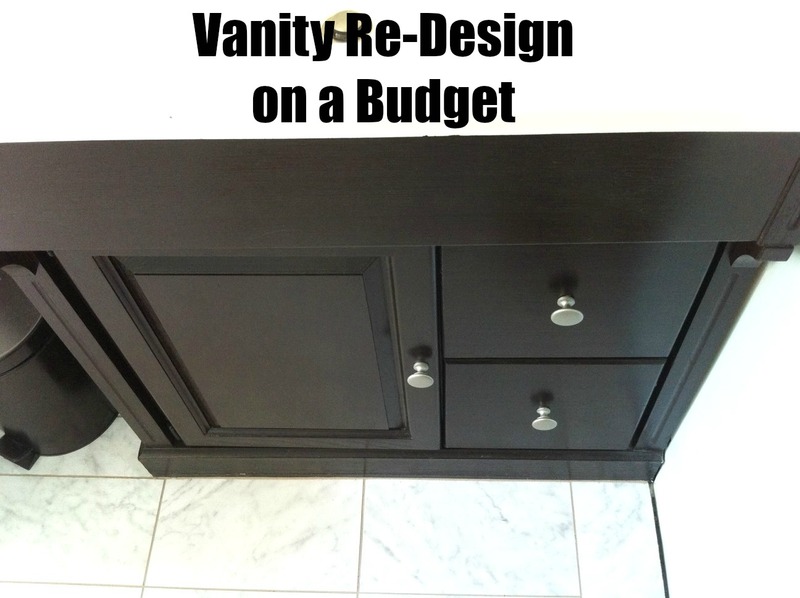 Since I am on a very tight budget when it comes to remodeling the house, a brand new vanity wasn’t even a consideration. 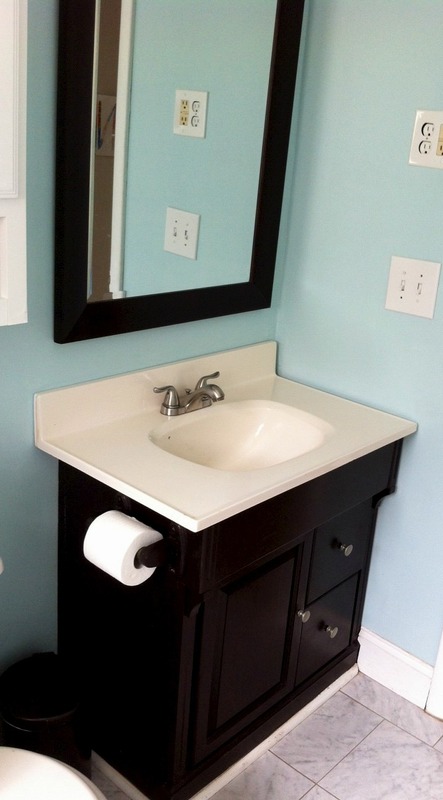 Besides, the old vanity is solid wood and sturdy. Why throw away something that has good bones and just needs a little cosmetic work? To me that would mean wasting money and perfectly fine material. Being short on funds is actually a blessing because it boosts your creativity and forces you think outside the box. Nothing wrong with that! 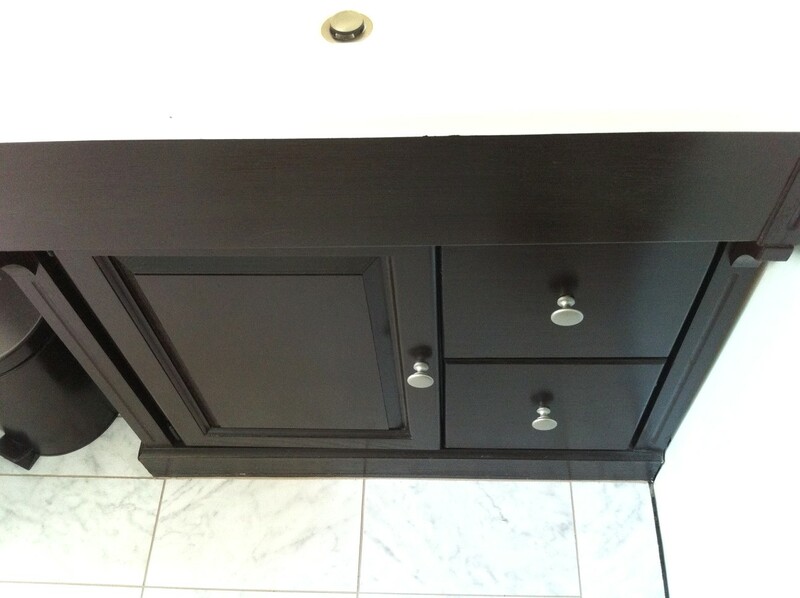 To update the look of the old vanity, I decided to stain it a dark espresso color. Here is a great tutorial if you want to try it – no need to bore you by repeating all that on my blog. I also purchased a faucet (the old one was cracked and leaked) at Home Depot (on sale for $29), and a large mirror at Lowe’s (on sale for $20 which I also stained to match the vanity). I spent $17.99 on the Java Gel Stain and $21.99 on the Polyacrylic. I ordered both here. You can also get them on Amazon. 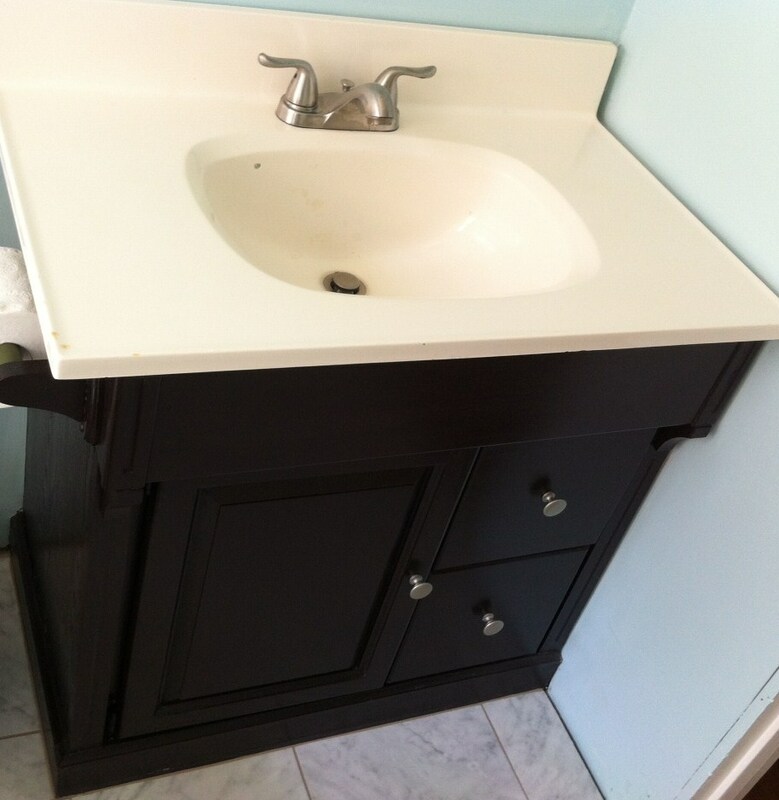 Let me tell you, one quart of Java Gel Stain was enough to stain the bathroom vanity, mirror, all my kitchen cabinets– and I still have some left. Crazy, right? The same goes for the Poly. This stuff is amazing! DO NOT SUBSTITUTE IT for another gel stain. I am all about saving money, but sometimes a more expensive quality product will save you money and time. I am very happy with my updated vanity. Honestly, I wouldn’t be any happier if the vanity was brand new. In fact, I feel more satisfied knowing that my two hands and just a few dollars accomplished this. The vanity serves us well. Sure, it would be nice to have a second bathroom, a double sink vanity, etc., but we are blessed for having one bathroom, one sink, one tub, etc. I tell the kids we need to be content with what WE have and that’s why I am grateful for my vanity. I love that bathroom! And the blue walls! Looks great! What an easy update!! Thank you so much. Not everything needs to be gutted. Sometimes it just takes a bit of effort and time to preserve older things. Thank YOU so much. I am going to do this in bathroom and kitchen but would not be doing it without you sharing your work. I am so excited to know that it is possible to have something so beautiful and easy and affordable and I can do this. Kathy,I am so excited for you. 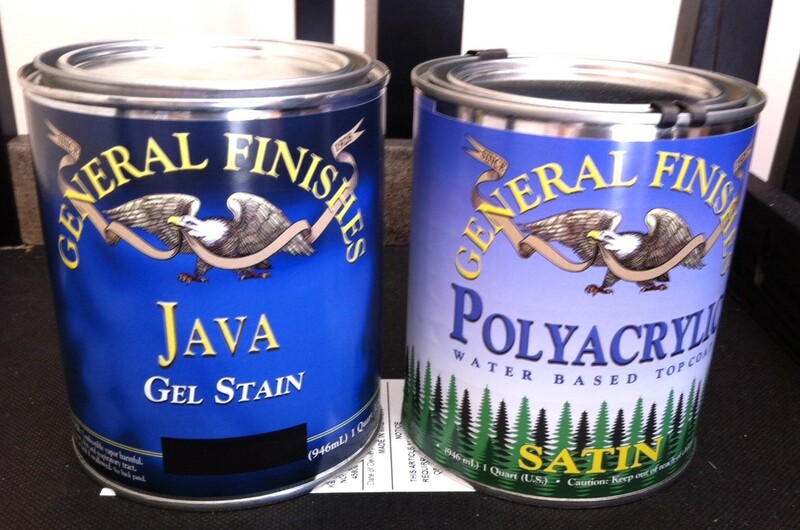 Working with Java Gel Stain is easy and affordable. My budget doesn’t allow me to tear out the kitchen and bathroom cabinets.Besides, they are solid wood and in good condition. Why throw it away? 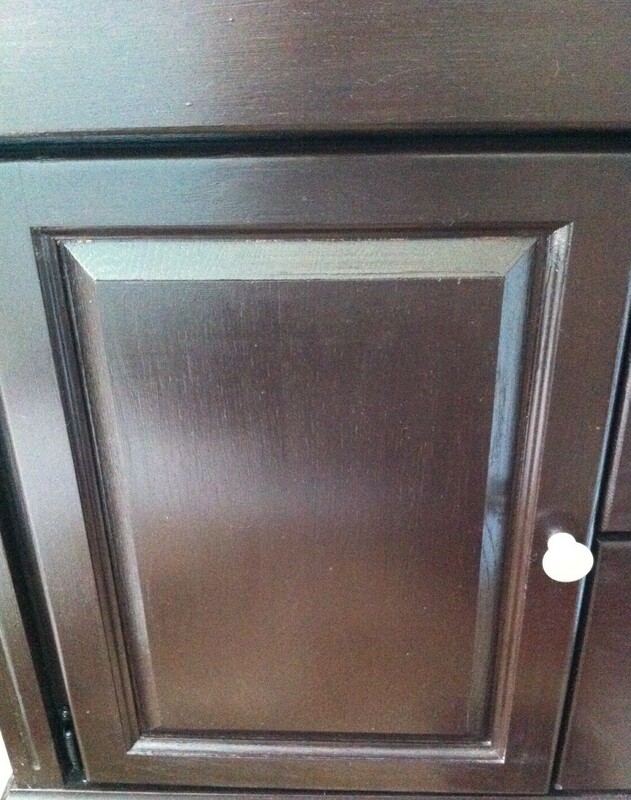 I love the dark color of my cabinets. It’s been one year since I stained them and they still look the same.